Behold: JBOY Longboat. 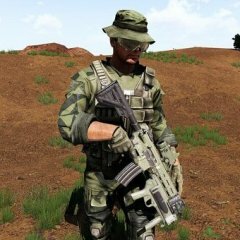 The first of many scripts to be released as the mission series Last Tango In Tanoa progresses. This script converts an assault boat into a Tanoan civvie long boat. Great for fishermen, pirates and insurgents. You can see this boat in action in my new mission Last Tango In Tanoa - Episode 1. 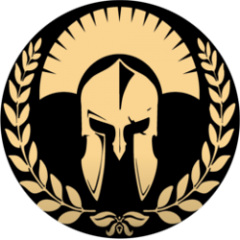 Please try that mission and rate and comment on steam. Your comments and ratings motivate me to finish the next episodes and create more scripts. If longboat has a mounted weapon, then maximum crew size is 4 (driver, 2 passengers, gunner). 1. Place an empty assault boat in the editor. 2. Place a call to this script in the assault boat's init box. _d = [this,""] execvm "Scripts\JBOY_LongBoat.sqf"; // Creates empty long boat without a mounted weapon. _d = [this,"B_T_Static_AT_F", [unit1, unit2, unit3, unit4]] execvm "Scripts\JBOY_LongBoat.sqf"; // create longboat with crew. Thanks johnnyboy for the script! Thanks for another great script! When developing, did you happen to try this on other static vanilla game boats (and/or wrecks)? If so, any success? Hoping to apply this idea in some WW2 missions (in non-tropical settings). Those poor Russians & Germans could use some boat transport over water (like US forces have). I used this technique to make the Trawler move, but boat is hidden inside trawler object, so not good for player or passenger shooters (only good for an ambient moving ai driven trawler with waypoints). Since zodiac is invisible, you can attach any object to it. But for drive and passenger seats to look good, you need a small boat object that is close to size of zodiac (which is why it works well for the Tanoan longboats). Pick another boat/wreck object you like and see if works for you. Roger all that. So I got it working nicely with "Land_RowBoat_V1_F". It's suppose to be a "row" boat (no engine etc), but it looks & plays great for WW2 missions imo. Had to rotate 90 degrees left, then rotate around forward axis by 19 degrees to get it perfectly aligned (as this object is listing to side by default). Using attachment point [-0.075, 0, -.8] and it looks very good. Still tweaking to minimize horizontal boards clipping with extra crew, etc. Also, it's possible to use all 5 crew positions if you use your imagination a bit for two the guys laying down. (Considering attaching some boxes underneath those two guys to get it looking perfect.) Thanks so much for the idea & script! Still tweaking to minimize horizontal boards clipping with extra crew, etc. Also, it's possible to use all 5 crew positions if you use your imagination a bit for two the guys laying down. Cool, that's exactly how to do it. You can attach extra stuff to dress it up. Fuel Cans, Backpacks, whatever. Too bad there isn't a static outboard motor object to attach to the back. Maybe someone knows of one. Post a screenshot and your modified script to share! Edit: One other thing you can do is attach more units who are using sitting passenger animations. You can really fill up your boats that way. But these units will not be able to shoot. Good for civilians, troop transport, prisoners, etc. This quick boat mod requires some of my vector rotation functions, which I posted here. _d = [this,""] execvm "Scripts\JBOY_LongBoat.sqf";  // Creates empty long boat without a mounted weapon. // Played with pitching boat slightly forward, to avoid front guy's gun slightly clipping through boat. Liked it a bit better the first way (without this additional rotation). // If anyone can improve this (even slightly), please post on JBOY Longboat thread, thanks! 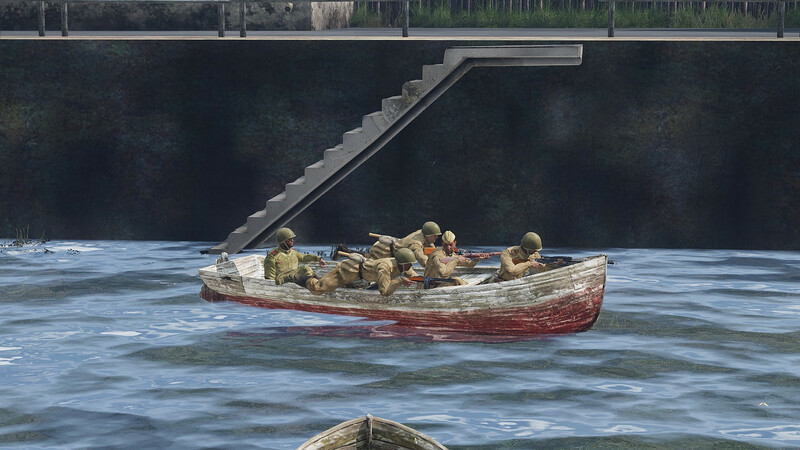 Boat mod crew positioning is surprisingly good, but could definitely use some minor improvement (inc front guy's gun poking through hull slightly, etc). Please someone improve away and post here, thanks! Totally agree about having a simple static outboard motor object, that would be perfect. I have a question for you, if you don't mine. I am creating a marine interdiction mission, and am using EOS by banga bob to spawn the boats. Working great so far, BUT I would love to use your longboat script. That would really set the appetite for destruction. I've been trying to use your long boat script to change the assault boats. There is no mechanism to use custom code in EOS, that I've found. Any ideas? Is it possible? I am using trying these lines since EOS spawns with crews. I just can't figure out how to reference the units. Any help would be appreciated it. I am creating a marine interdiction mission, and am using EOS by banga bob to spawn the boats. Working great so far, BUT I would love to use your longboat script. Hey Blackheart. I'm pretty sure you can make it work. You just need to detect the spawned boats, and then run my script on them. I am not familiar with EOS so I don't know how to find his boats. 1) Spawned boat has more crew than is allowed in Longboat. You might have to modify my script or the above snippet to delete a few crew members. Maximum is 3 units for longboat without a mounted weapon. Or 4 units for longboat with a mounted weapon. 2) Does EOS also give spawned boat crew move waypoints? Will those still work after we force units out of boat and back in? Hopefully their waypoints still work after they are remounted in the hidden assault boat. Thanks for the follow up. I'll check it out. I did find SPL_Spawn which allows for custom code. I messed around a little bit with it, but would have to redo everything with the scenario.